Levi Strauss holds one truth to be self-evident: jeans are one heckuva thirsty animal. In a new report on Tuesday, the denim giant unveiled the results of its latest product life-cycle assessment, an update to its original, first-of-its-kind 2007 study. Despite expanding its scope to include other cotton-producing countries, including China, Brazil, Pakistan, and Australia, Levi’s found that cotton cultivation and consumer use have a near-universal claim on denim’s water footprint. The numbers speak for themselves. Even accounting for regional differences in washing habits, a single pair of jeans uses nearly 3,800 liters of water throughout its lifetime. Roughly 68 percent of that agua stems from fiber production, with consumer care accounting for an additional 23 percent. The way we care for our jeans is also responsible for a significant expenditure of energy, culminating in 37 percent of the 33.4 kilograms of carbon dioxide emitted during denim’s life cycle. 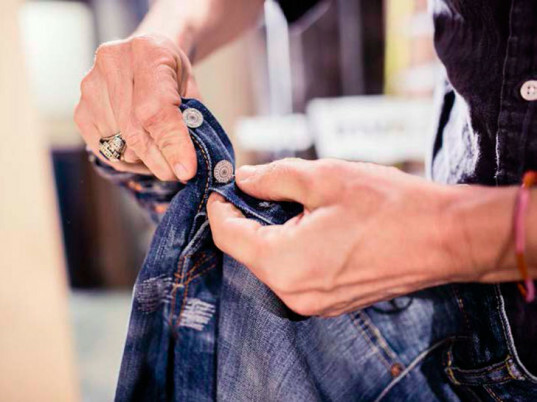 The LCA reveals some interesting facts about the denim-wearing across the globe, as well. We Americans, researchers say, use more water and energy to wash our jeans than our counterparts in China, France, and the United Kingdom. We could also pick up some pointers from Chinese consumers, who wear their jeans an average of four times before tossing them into the wash. If most Americans followed suit, Levi’s says we could reduce the water and climate change impact from washing our jeans by a whopping 50 percent. “It’s time to rethink autopilot behaviors like washing your jeans after every wear because in many cases it’s simply not necessary,” says Chip Bergh, Levi Strauss’s CEO and president, in a statement. 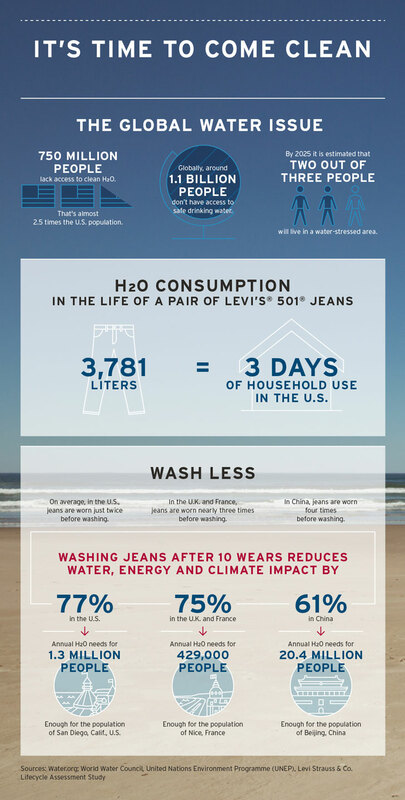 In the run-up to World Water Day on March 22 and Earth Day on April 22, Levi’s is launching an educational initiative to help consumers understand their environmental impact. To find out how your water and energy use compares with others, simply go online to take the “Are You Ready to Come Clean?” quiz. You can further pledge to do your bit by washing your jeans more infrequently. For its part, Levi’s is working with the Better Cotton Initiative to train farmers to grow cotton using less water. The company will also continue to work toward using less water during the manufacturing phase by expanding its line of H20-sipping Water<Less products. Levi’s says it aims to make 80 percent of its products using Water<Less techniques by 2020, up from nearly 25 percent today. Something’s obviously working. 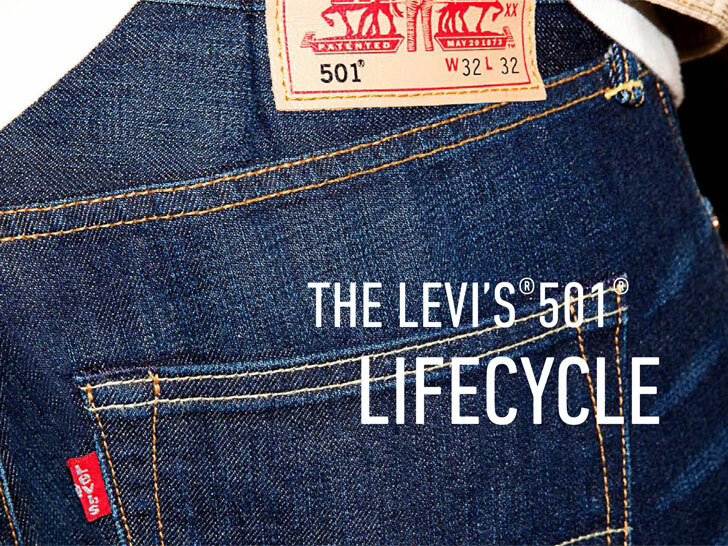 Levi’s says it has saved 1 billion liters of the wet stuff since 2011 through its sustainability schemes, including the “Care Tag for the Planet” clothing-care program it pioneered with Goodwill and its groundbreaking water reuse/recycle standard. Levi Strauss holds one truth to be self-evident: jeans are one heckuva thirsty animal. 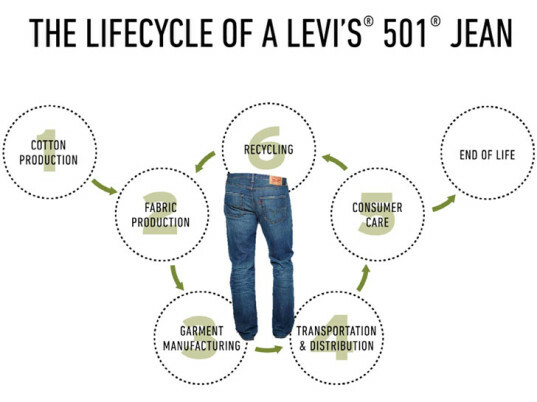 In a new report on Tuesday, the denim giant unveiled the results of its latest product life-cycle assessment, an update to its original, first-of-its-kind 2007 study. Despite expanding its scope to include other cotton-producing countries, including China, Brazil, Pakistan, and Australia, Levi's found that cotton cultivation and consumer use have a near-universal claim on denim's water footprint. The numbers speak for themselves. Even accounting for regional differences in washing habits, a single pair of jeans uses nearly 3,800 liters of water throughout its lifetime. Roughly 68 percent of that agua stems from fiber production, with consumer care accounting for an additional 23 percent.